Last evening's farewell dinner deserves a post of its own. I made a point of writing down the names of all the courses as they were served so that I would not forget any. We walked as a group from our hotel to the restaurant which is fairly close to the cathedral (as is our hotel). At first, of course, we had bread ("pan Gallego) -- the wonderful, crusty Gallician bread that we have been enjoying for the last few days. There was a good olive oil for dipping. Along with the bread, there were platters of three different cheeses, all delicious. Then the courses starting coming in earnest. 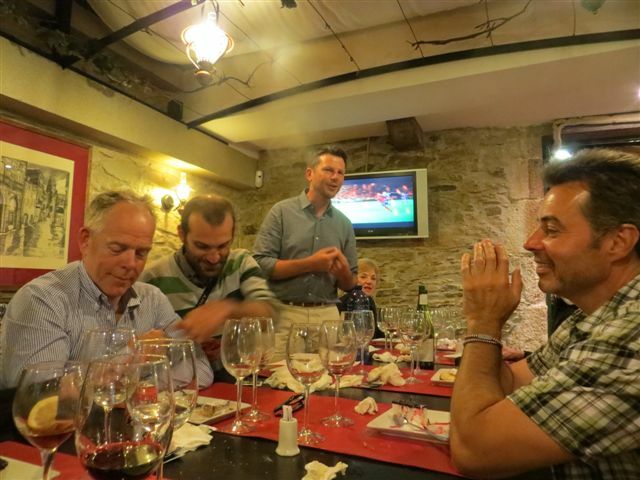 In almost all cases, they served more than our adventurous group could finish.First to arrive were "empanadas gallenas," filled with cod, tomato and various other goodies. Next was the salad, with lettuce, tomato, tuna, asparagus, egg, and carrots. 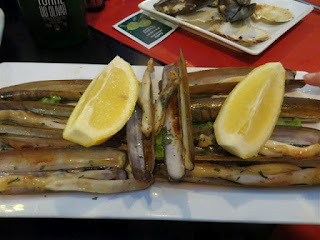 This was followed by platters of "pulpos," octopus similar to what we had for lunch in Melide yesterday, but frankly not as good. Perhaps that is why the pulperia in Melide is a must for pilgrims passing through. "Gambas," huge shrimp served whole (head and all) were next. They, too, were delicious. Most of us Americans are unused to having our shrimp served with the head on and were not as adventurous as our guides in sucking the flavor out of the heads. Meanwhile, the true Spanish flavor of the occasion was enhanced by the fact that Spain was beating Ireland in "futbol" (soccer). The game was being shown on television in several locations throughout the restaurant and a loud cheer went up at every Spanish goal. The red and white wines which were flowing also enhanced the festive mood. Of course, the food kept coming. Calimari was next, and it was the best calimari most of us have ever had. It was very lightly dusted with flour and fried to tender perfection. 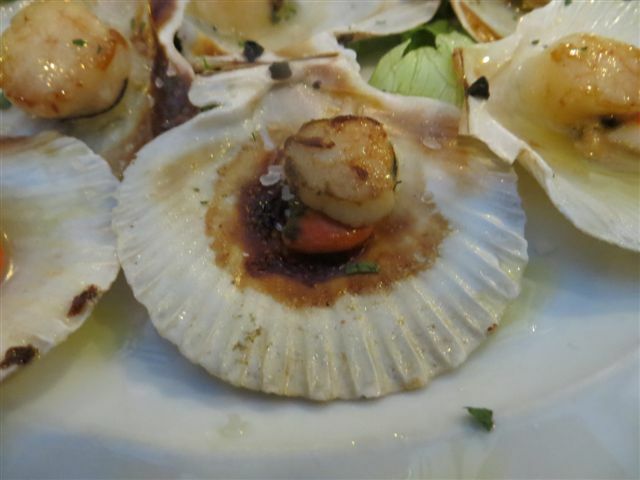 After the calimari, came scallops served on the half shell. Again, for most of us Americans, this was a new experience since we can only buy scallops at home that have already been removed from the shell. Moving on to the next course, several platters of mussels were brought out. These were followed by "navajas," or razor clams. These long, thin clams were entirely new to me. The word "navaja" means penknife or razor. Next was "tortilla de esparrrago" -- similar to the breakfast omelet with potatoes that we have frequently been served, this egg omelet had fresh white asparagus. 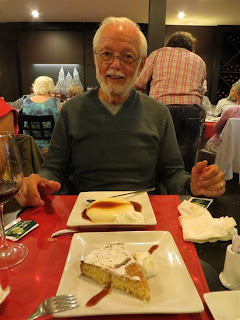 Next came a choice of desserts -- either flan (which I chose), or cheesecake or tarta de Santiago (which we had previously tried for Larry's birthday). All good things must come to an end, and this meal ended with farewells from our guides, Philipp, Belen and Enrico, to us, and from us to them. During these final moments we were offered a selection of coffees and local liqueurs. We had left the hoetel at eight, and did not finish the meal until just before midnight! Philipp and Enrico said goodbye as they had to leave very early this morning to drive the van and bicycles to the next tour starting point (I forget which city, but I know that they have an eleven hour drive). Belen had breakfast with us this morning and then she heads home for a week, after which she will start her second camino! Larry and Pat left for an early plane. 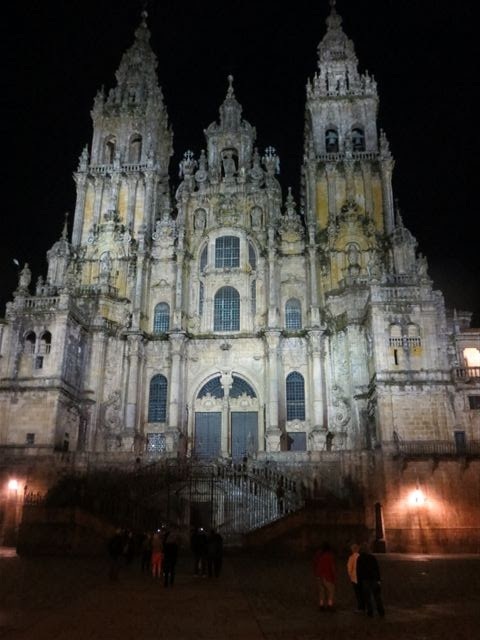 Which leaves Mary Kay and Bob, Nancy and Mike, and I to enjoy hour last few hours in Santiago, including the Pilgrim's Mass at noon. Tonight I fly to Madrid, and back to San Francisco tomorrow.